“If you consult ‘Who’s Who in America’ you will find the following paragraph — ‘Tesla, Nikola, electrician, b. Smiljan, Lika (border country of Austria-Hungary), 1857: s. of Greek clergyman and orator and of Georgina Mandic, who was an inventor, as was her father.’ There follows a long and impressive list of his discoveries and accomplishments, hardly intelligible to the average reader unversed in the mysteries of electricity. To the world he is best known as the discoverer of the alternating-current system and as the man who harnessed Niagara Falls. THE HUGE MACHINERY STANDS SILENT, AND THE OFFICES SHOW SIGNS OF HURRIED DEPARTURE — "The magic word has not been spoken, and the spell still rests on the great plant." “Like all geniuses, he is a dreamer and a spender. His dreams have been so real to him that he has persuaded investors to back him in many enterprises. The greatest monument to his unfinished dreams is his immense laboratory at Shoreham, L. I. Fifteen years ago he was given a large tract of land in the town then called Wardenclyffe. A local builder hastened to erect houses for the workmen that came from the city, and the town felt that great prosperity was ahead of it. 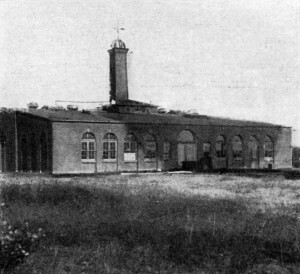 A huge brick building was finished, and above it a steel tower capped by a copper dome 185 feet above the ground. Workmen reported that pipes had been sunk in the earth to almost an equal number of feet. Carefully crated machinery arrived by train and was installed in the brick laboratory, and a group of silent workmen worked day by day. 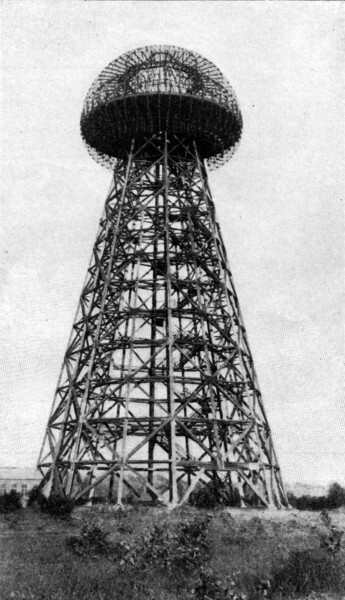 NOT BUILT TO BE BUT A LANDMARK — Like the rest of Tesla's mystery, the purpose of this mushroom tower, with it's 185 feet of structure and its copper-covered dome, is unknown. But Tesla still dreams, and it may yet come to life.